This summer school will gather for the first time researchers in physics, mathematics, signal processing and neuroscience working on the identification of complex systems. A challenge is to group efforts from the theoretical perspective of statistical signal processing on complex networks, and pratical considerations for analysing brain activity and connectivity. The research developments on these topics are necessarily multi-disciplinary, with expertise from neuroscience, signal processing, statistics. This school will be an unique opportunity to get together scientific experts from graphical models, information theory and neuroimaging in order to propose new paradigms to extract brain functional connectivity using fMRI, EEG, MEG and DTI. 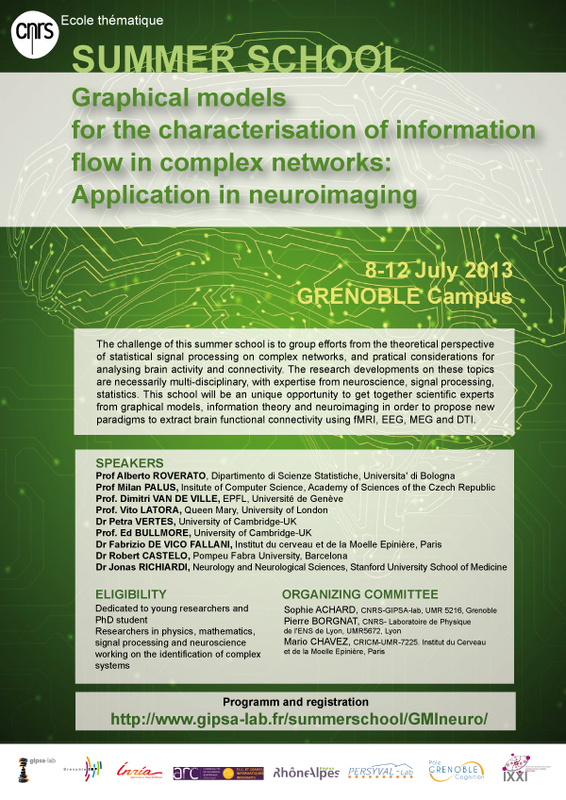 The summer school will take place between 8 July and 12 July 2013 in Grenoble, the heart of the alps. The participants will be accommodated in a brand new hotel next to the city center, Résidence Galilée Grenoble..
Visit this page for the contact details. If you are interested in this summer school, do not hesitate to contact us!